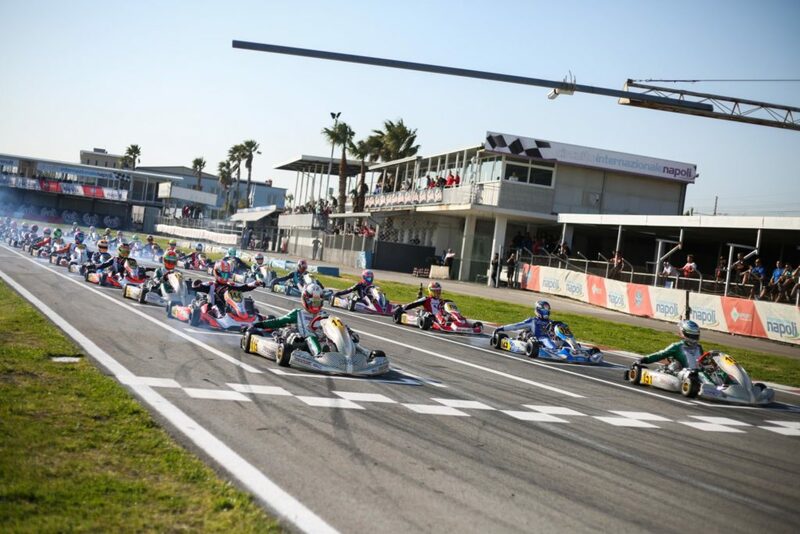 The fourth and last round of the 2019 WSK Super Master Series has officially kicked off this Friday in Sarno. The almost 300 drivers forming this weekend’s impressive racing field have completed their respective Qualifying series before tackling their initial Qualifying Heats. Even at this early stage, every point up for grab can already make a difference in the quest for glory, whether it’s a Prefinal starting position, the final victory or even the series’ title for some of the contenders in each of the four classes on track! 151,Ardigo' Marco(N/A),Tony-kart racing team(TONYKART/VORTEX/BRIDG), 115,Camplese Lorenzo(ITA),Camplese Lorenzo(TONYKART/VORTEX/BRIDG), Sarno, 24 March 2019. WSK Super Master Series, © 2019, Alexandros Vernardis / The RaceBox. Class leader Dexter Patterson (KR/IAME) was quick to assert himself by setting the fastest qualifying lap (57.303) in the Senior category. The Swede Dino Beganovic (Tony Kart/Vortex) emerged from the series as second-fastest (first in Group B) ahead of Dilano Van’t Hoff (Exprit/TM, first in Group C) and Gabriel Bortoleto (CRG/IAME, first in Group D). The other title contenders concluded their effort further down the timing order with Taylor Barnard (KR/IAME) in 6th, Gabriele Mini’ (Parolin/TM) in 8th and Lorenzo Travisanutto (KR/IAME) in 12th (click here for the full Qualifying results). Dexter Patterson kept his momentum going in the first Heat of the weekend (A-B) that he won ahead of Taylor Barnard and Pedro Hiltbrand (CRG/IAME) before Brazil’s Gabriel Bortoleto preceded Gabriele Mini’ and Joshua Dufek (KR/IAME) in the C-D race. Amongst the Juniors, Finnish driver Tuukka Taponen (Kosmic/IAME) took the category’s Pole position in 59.358 seconds to start up front in the first of the five heat groups. Laurens Van Hoepen (FA Kart/Vortex) came in second position on the timesheet (first in Group B) with Tymoteusz Kucharczyk (Parolin/TM, first in Group C), Artem Severiukhin (Tony Kart/Vortex, first in Group D) and Alex Dunne (Tony Kart/Vortex, first in Group E) completing the top 5 (click here for the full Qualifying results). Four Qualifying Heats were on schedule this Friday and James Wharton (FA Kart/Vortex) won the first (C-E) in front of Alfio Spina (KR/IAME) while polesitter Kucharczyk finished P6. Laurens Van Hoepen made good use of his pole by winning the B-D race as did Thomas Ten Brinke (FA Kart/Vortex) in the A-E and Artem Severiukhin in the C-D.
British driver William Macintyre (Parolin/TM) set the qualifying pace in 60 Mini by putting together a lap of 1:07.178 to clinch overall Pole position. Keanu Al Azhari (Parolin/TM) followed as second-fastest (first in Group B) for less than three hundreds of a second in front of Giovanni Trentin (Parolin/TM, first in Group C), Dmitriy Matveev (Energy/TM, first in Group D), Coskun Irfan (Parolin/TM, first in Group E) and Gerasim Skulanov (IPK/TM, first in Group F). The series’ leaders Ean Eyckmans (Parolin/TM) and Rashid Al Dhaheri (Parolin/TM) set respectively the 12th and 15th-time performances (click here for the full Qualifying results). Maksim Orlov (Parolin/TM) won the first Qualifying Heat (A-B) that followed in the afternoon where both front starters William Macintyre and Keanu Al Azhari retired one lap from the finish. Antonio Apicella (Energy/TM) claimed the C-D race ahead of Rashid Al Dhaheri, Maciej Gladysz (Parolin/TM) defeated the polesitter Coskun Irfan (E-F) while Joel Bergström (Parolin/TM) won the A-C race, Dmitriy Matveev the D-F and Al Azhari the B-E opposed to Irfan finishing again in the second place. The chase for Pole position smiled upon Lorenzo Camplese (Tony Kart/Vortex) that completed the 1500 meter-long layout of Sarno in 56.402 seconds to take the front starting spot in the Group A. Group B is lead by Marco Ardigo’ (Tony Kart/Vortex, second-fastest), Group C by Giuseppe Palomba (Croc Promotion/TM, third-fastest) and Group D by Giacomo Pollini (Formula K/TM, fourth-fastest). The series’ leaders Adrien Renaudin (Sodikart/TM) and Bas Lammers (Sodikart/TM) followed with the 7th and 12th lap times respectively (click here for the full Qualifying results). Marco Ardigo’ named himself the first winner of the KZ2 class by beating his Tony Kart teammate Matteo Vigano (Tony Kart/Vortex) and polesitter Lorenzo Camplese in the A-B race. The second Heat of the day (C-D) fell into the hands of another Italian driver, this time Giacomo Pollini, ahead of Paolo De Conto (CRG/TM) and Giuseppe Palomba while points’ leader Adrien Renaudin was forced to retire four laps from the end. The closing round of the WSK Super Master Series continues this Saturday with the rest of the Qualifying Heats in order to determine the starting order for Sunday’s Prefinals. Click here to follow the action on track. Check out also our video preview of Sarno in the latest episode of the RaceBox Show! Click here to download the complete schedule. The RaceBox is also active on Facebook, Twitter, and Instagram.